A decade ago most employees in top corporate entities didn’t have a clue who formed their senior executive leadership teams — a small percentage never had the opportunity to learn about their CEO. Now with social business, leadership transparency within corporate portals is slowly surfacing and employees are developing a greater understanding of holistic operations. With millennials entering the workforce in vast numbers who are champions of the social culture, will demand the transparency in the future of work — resulting in leadership transparency to be the norm in order to build the level of trust and credibility with the younger generation. Furthermore, the adoption of internal social networks allows for employees of all generations to share the depth of knowledge and demonstrate authenticity — driving the empowerment across business lines without hierarchical boundaries. Employees who are quickly learning the advantages of this new vehicle to communicate in real-time are reaping the benefit of closing the gap between virtual teams and enabling increased productivity in the workforce. Today’s uber-connected, empowered individuals seek 24/7 access and organizational transparency. They want to exert greater personal influence over organizations and participate in more digital activities as they conduct their daily lives. 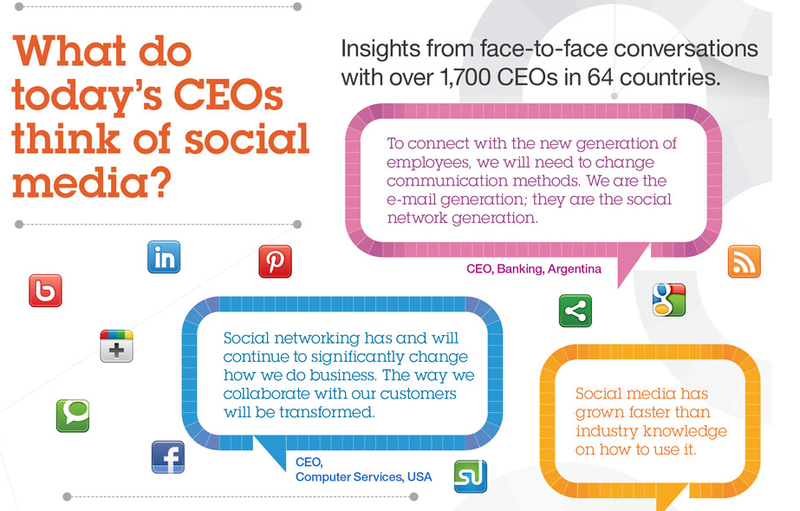 IBM also conducted a study on CEOs and social media — a snapshot of the infographic is below and the global study can be accessed here. Based on the latest research and with 88% of millennials preferring a collaborative work-culture rather than a competitive one, there’s no argument that social business is revolutionizing leadership transparency!